Jerry L Walls. Does God Love Everyone? The Heart of What is Wrong with Calvinism. Eugene, OR: Cascade Books, 2016. 88 pp. $15.00. ISBN: 978-1620325506. I grew up in a Christian tradition that was deeply steeped in Calvinist theology. Although once part of the Conservative Baptist Association, our little church in New England eventually broke away from that denomination and became an independent Bible church. Looking back, I would have called us four or four-and-a-half point Calvinists, the doctrine of limited atonement being the only questionable plank in the venerable TULIP acronym. Still, it was indubitably true that everything that occurred did so not only on account of God’s will, but explicitly by his creative decree; and that God had graciously out of his own love chosen the elect to save from this ruinous world, and that he drew them to faith in himself by his irresistible grace. If anything was true of the Christian faith, it was these things (along with total depravity and perseverance of the saints). When the traditional texts were presented as proof of these doctrinal dogmas, I could only nod in agreement, finding no fault in how Scripture was read and interpreted. It was upon this theological rock that I began to build my spiritual home, confident that I knew God’s Word and was acting in a wise and prudent manner. Yet a funny thing happened during my late teens and into my early twenties. The more I sunk my Christian foundation into the bedrock of Calvinism, the more fragile and volatile my spiritual life and commitment to Christianity became. A number of unspeakable evils befell my family one after another; prayers went unanswered; God remained hidden despite earnest seeking; life floundered and became dark. I despaired. How could a God of love personally cause these horrendous evils and yet still be perfectly good? How could I trust God to be loving when he determined people to sin, and then held them accountable for what they could not have refrained from doing? I desperately sought to hold these disparate theological tenets in proper balance, but the tension tore me apart. Intuitively I knew that if God was the ultimate cause behind evil, then he was evil; slowly, and in a dangerously creeping way, I began to hate this God of Calvinism even while I outwardly mouthed all the right doctrines. What I sorely needed at this point was a viable, biblically sound, and alternative understanding of the basic Christian teachings about God’s sovereignty and love, human sin, election, salvation, Christ’s atonement, and faithful discipleship. Although I eventually came to reject Calvinism half-way through college (and later adopted thorough-going Arminianism in seminary), I could have been spared many years of frustration, confused thinking, and spiritual deadness had someone placed Jerry Walls’s most recent book in my hands. Walls’s book is short, and pulls no punches. 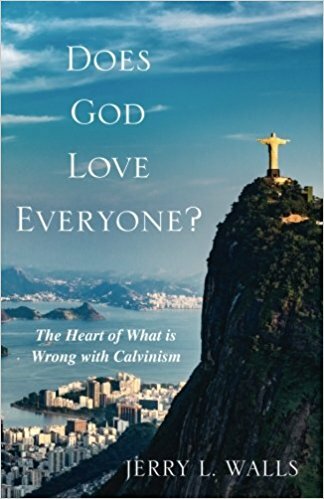 The title gives away Walls’s main contention: despite the endless rounds of debates between Calvinists and Arminians regarding the nature and extent of God’s sovereignty, his omnipotence, and his purposes in salvation, the heart of what’s wrong with Calvinism is that, when consistently followed to its logical end, it teaches that God does not truly love everyone. This is deeply problematic from both a theological and biblical standpoint, as a perfect divine being must love everyone without fail (or by definition he would not be God) and as revealed Scripture avers that love is so integral to God’s character that it can be described as part of his essence (“God is love” in 1 John 4:8, 16). Before he gets there, however, Walls covers some basic issues. In chapter 1 Walls notes that classic Calvinist texts have long overlooked the importance of God’s love. The Westminster Confession of Faith (WCF), in answer to the question “What is God?” names essential attributes of God but notably leaves out love; and not once in the almost 2,000 pages of John Calvin’s Institutes of the Christian Religion does he cite either 1 John 4:8 or 1 John 4:16. In chapter 2, Walls reviews some basic theological systems, contrasting Calvinism’s TULIP acronym with Arminianism’s FACTS or ROSES. Walls then summarizes the doctrines of unconditional election, eternal security, and the fate of the non-elect according to Calvinism, pointing out that the WCF goes so far as to assert that God was pleased to ordain some people to wrath for their sins so that God’s glory and justice might be made known. Walls lingers on this last consideration, noting that whatever reason God has for not electing the reprobate when he could of is inscrutable to us humans, a situation that often propels Calvinists to emphasize God’s sovereignty and control instead of actually offering a theodicy in light of eternal damnation. The chapter ends with a brief discussion of limited atonement according to Calvinism, historically understood as Christ dying only for the elect, not Christ’s death being applied only to the elect. In other words, Christ’s death did not atone for the sins of the non-elect or purchase their redemption in any way—despite what 1 John 2:2 says. The doctrine of irresistible grace is the focus of chapter 3. Calvinism usually distinguishes between two kinds of gospel calls: the general call that goes out to everyone, and the effectual call which is meant only for God’s elect. Supposedly, such a distinction allows Calvinists to preach the gospel as a genuine offer, even if the unbelievers they preach to are not elect. What makes the effectual call irresistible is that it is God who opens the eyes of the lost, softens their hearts, restores their corrupted will, and gives them the faith to believe so that they might be saved. On this Arminians and Calvinists agree: that we are completely helpless to save ourselves apart from God’s gracious initiatory work to reveal his salvation and draw us to himself. Yet while Calvinists understand God’s salvific work as being his alone, Arminians believe that each person has a part to play that is up to them—namely, receiving and believing in the gospel of Christ. Given this, Calvinists face a problem: if salvation is accomplished by God alone and is in no way dependent upon humans, what prevents the general call and effectual call from being coterminous? If God is the one who alone makes the general call irresistible and thus effectual, what is preventing him from granting everyone irresistible grace and thereby saving all? Since Calvinists hold to compatibilistic forms of human freedom, which claim that theological determinism and human freedom are compatible, God could causally determine everyone to freely believe and be saved. This realization casts doubt upon the justice of God’s judgment: if the reprobate refused a call that they could not have accepted because God did not grant them the irresistible grace needed to believe, how can God hold them morally accountable and justly judge them? As Walls pithily sums it up, “For the elect, God makes them an offer they literally cannot refuse, but those who are not elect receive an offer they literally cannot accept” (27). Truly to love someone is to desire their well-being and to promote their true flourishing as much as you properly can. Therefore, all persons will be saved. The Calvinist upholds premises 1-5, which if true, necessarily yield premise 6. Yet premise 2 and 6 are contradictions, showing that at least one of the other premises is false. The Arminian can resolve the tension by rejecting premise 5 (replacing irresistible grace with prevenient grace, which only makes it possible for all persons to be saved), but what is the Calvinist to do? Premises 1, 2, and 5 are strongly held by most Calvinists, so that leaves premise 3 or 4 open to question. Yet these two premises work in tandem to flesh out what it means to love someone (i.e., to will the good of another), and especially what it means for God to love humans—the pinnacle of his creation—whom God made specifically for fellowship with him. Given that the WCF famously declares that the chief end of man is to glorify God and enjoy him forever, it is puzzling, if not outright incoherent, for Calvinists to claim that God can truly love someone but not bring about their salvation (especially since God can determine all people to freely believe by granting them irresistible grace). One cannot glorify God and enjoy him forever in Hell. Thus the Calvinist finds himself in a pickle: affirm that God loves all people and you must consequently affirm salvific universalism; deny universalism and this requires denying that God truly loves all people. Walls demonstrates that the consistent Calvinist cannot both affirm God’s universal love and hold that only some will be saved, and thus, “A fully consistent Calvinist who truly understands unconditional election, limited atonement, and irresistible grace will deny that God loves all persons” (34). Since Scripture clearly teaches that God both loves everyone and that some will forever perish, Walls’s argument in conjunction with the biblical data provides a defeater to Calvinist theology. Most Calvinists respond to the above argument by differentiating various kinds of divine love. How is it that God genuinely loves the non-elect when true love would compel him to bring about their salvation? By distinguishing between (1) God’s providential love for creation, (2) his salvific stance toward fallen humanity (God’s general call), and (3) his particular and effective love toward the elect (God’s effectual call), God can be said to truly love the non-elect because he loves them in the first two senses. The problem with this is that anything short of loving someone unto salvation—if one is able to do this—is not really love. “Loving” a person by sending the sun and rain, or holding out the offer of salvation knowing they cannot accept it, is a hollow and meaningless “love” that would only come from a capricious God. As Jesus says in Matthew 16:26, “For what will it profit a man if he gains the whole world and yet forfeits his soul?” Apart from coming to know God through Jesus Christ and glorifying and enjoying him forever, the benefits from God’s lesser loves are futile. Despite the Calvinist’s protestation that God has other goals he desires to accomplish through the reprobate—the full manifestation of his glory, wrath, and justice—the idea that damnation makes possible other greater goods falls flat once we realize that the greatest good for humanity and the greatest glory for God is for us to know God and enjoy him forever, which is what Christ’s atonement is all about. It becomes clear in this light that consistent Calvinist theology not only denies that God loves everyone but also obscures the gospel message of Jesus Christ himself. In the second half of the book (chapter 6), Walls writes beautifully about a theology of divine love. He lays out more thoroughly an Arminian/Wesleyan understanding of God’s universal love, the death Christ died for all because of that love, and the genuine opportunity for salvation that is consequently made available to all. This message of love, hope, and redemption is still needed in our broken world, and if Walls’s book can help clear away the philosophical and theological cobwebs to enable Christians to more clearly proclaim this gospel, then it is well worth reading.